This skirt is by Isabel Marant, who is my favorite designer (if you follow my #OOTD stories on Instagram, you've probably noticed that I wear a lot of her line). She makes this silhouette every season in different fabrics, usually prints, and frequently in silk. The top is ruched elastic, and the bottom has tiered ruffles. It's youthful in spirit but friendly to not-so-perfect bodies, and I've been wanting to try it for ages. I spotted it online and decided to treat myself for my birthday, and I'm so glad I did. The skirt is flattering and comfortable, and while I am so not a floral-print person, I guess I'm a floral-print person if Isabel Marant is doing it. ;) The best part is that you can adjust the length by pulling it up to your waist or wearing it a little lower on your hips. And the elastic expands to accommodate, say, that big brunch you just ate (like I did in these photos). 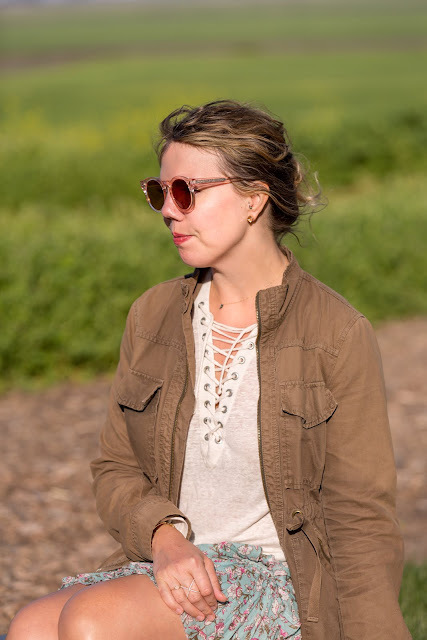 I've had this jacket for probably 10 years—it's J.Crew's field jacket, a style they've been making forever, and still do (the current version is a little more blinged out than mine, but I've linked a similar style below as well). It's faded and the armhole facing is starting to pull out, but I love it and wear it all the time. 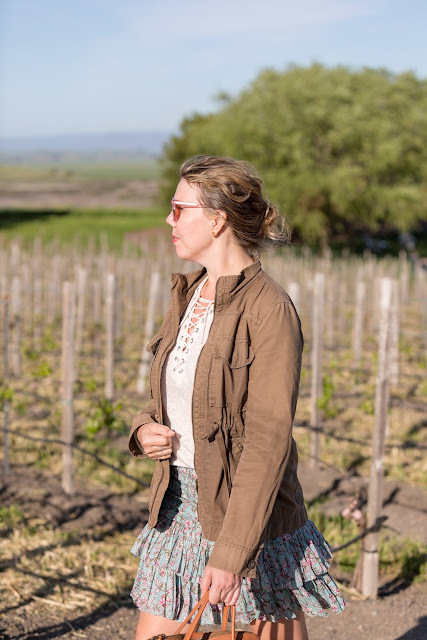 I think it's the perfect spring (and fall) jacket, and it adds a little ruggedness to your look—in this case, to balance my super-feminine floral skirt. The top is by Iro, which is another one of my favorite designers. I tried to feature it once before here, but the outfit was just not working out; it's a little tricky to photograph because it's so loose-fitting. I got this on major sale and I'm wearing a medium, which is too big (I should have gotten a small), so I suggest sizing down! It is really comfy and flattering though, and I love the lacing detail. I'm carrying my birthday bag and wearing my Box of Style sunglasses again (both seen in my last post)—these are definitely two of my new favorite accessories. I kept my jewelry simple since there was so much going on in this outfit. As for the shoes, I had wanted a pair of flatform espadrilles and got these last summer. They're a little ridiculous (I kept laughing during this shoot when I tried to walk in them), but they give you a little height and they're pretty comfy. I just don't recommend driving a car in them! 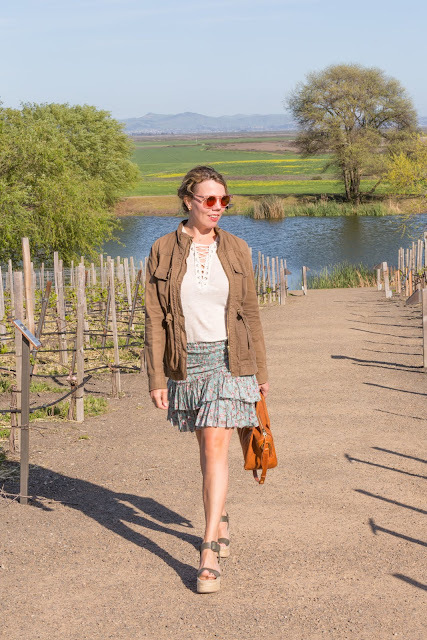 We shot these photos at Ram's Gate Winery, which is the first one you hit in Sonoma when you're driving in from the city. It had been awhile since I'd been there and I'd forgotten how delicious their wines were (we bought a bottle of everything we tasted!) and how gorgeous their space is. The winery itself is a beautiful, modern, barn-like building, with a big patio and a nice pond that you can hang out by. I highly recommend it if you're ever in Sonoma! And now, onto the linkup! 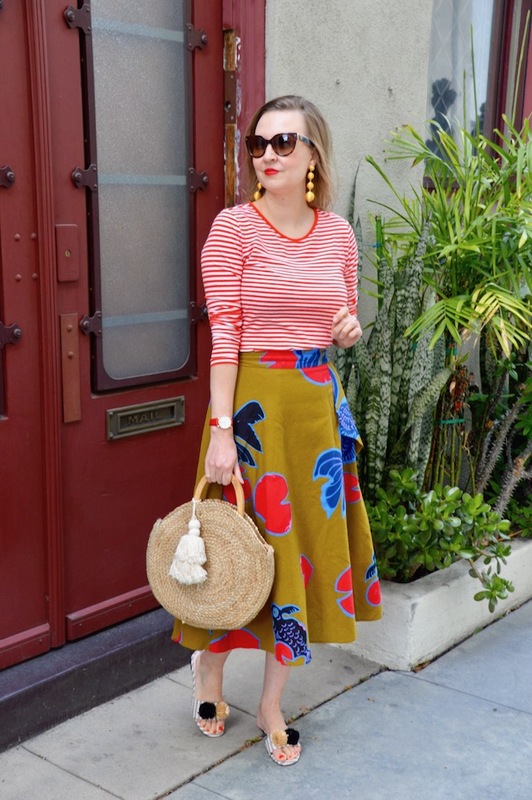 My favorite look from last week's linkup is Hello Katie Girl, a fellow Californian! I love how she mixed two very different, colorful prints—and accessorized like a pro. Stop by and give Katie some love! To Link Up: Follow me on: Instagram | Pinterest | Facebook | Twitter and Jennie on at least one outlet and link back to this blog on your site. Make sure you link to a specific post, not just your blog. By linking up you are saying it's ok for A Pocketful of Polka Dots to send you a short & sweet reminder e-mail. Finally, make sure you go and visit other Fabulous blogs! Cheryl, this is such an adorable outfit! I am glad you tried out a floral skirt, too, because you totally nailed this fun look! The field jacket is the perfect topper keeping the outfit feminine yet outdoorsy. Your photos are gorgeous, too! What a wonderful skirt, Cheryl!! I love the ruffles and how versatile it is!! Such a cute skirt! And what a beautiful location too! Happy Friday! Love that you took the chance on the floral skirt. I adore floral print, so I often wear them! I think you are slowly converting to our side! I also love it paired with the jacket! Fabulous outfit! 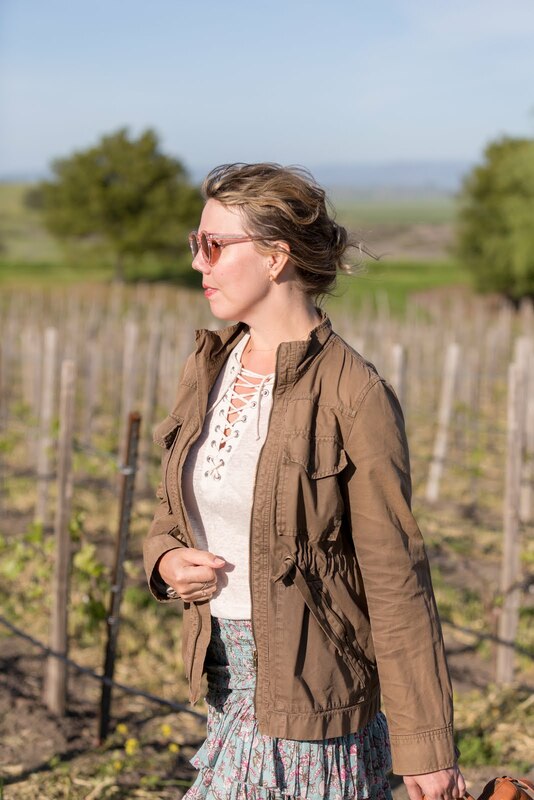 Great jacket and perfect spring look!I linked up with Jenny bright and early this morning and saw your email when I got home this evening so popped over to your site too. Hope you had a great day! 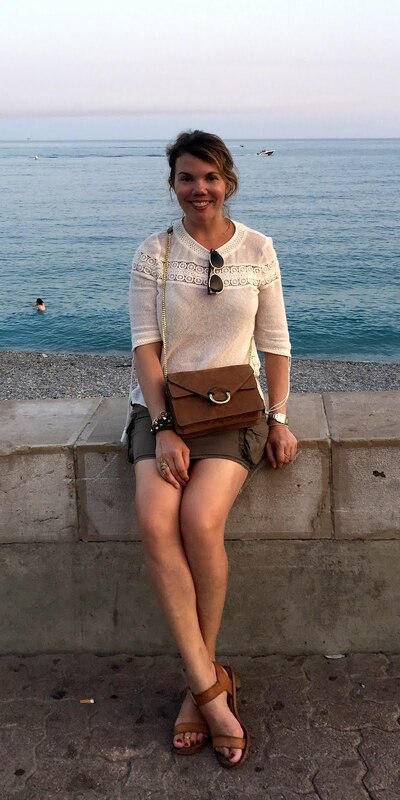 Lovely Skirt Cheryl, love how you have styled it :) Thanks for sharing at The Weekend Blog Hop # Weekendbloghop. Thanks for the invite too, just linked up my latest style post. Love the classy outfit! Thanks for hosting the link-up! I will be hosting a Friday link-up starting this week and would love to have you join me! I love your skirt and how you styled it. Thanks for co-hosting! I am absolutely with you on trying new things. High five, sister! In fact, I just started a new blog series about Stepping Outside My Comfort Zone. Not only in life but in fashion. And I started this month's escapades by shopping at a new store and trying on dresses I would otherwise have been too scared to try. You are so very put-together in this cute casual look. Perfect for shopping, sight-seeing, brunch or lunch out. And how about your legs??? Wow-wee, girl! Great look. Happy Belated Birthday pretty lady! I love your Californian style which truly shows in these pics and outfit. I used to own a very very similar skirt (like 10-12 years ago). You look lovely in this look Cheryl. =) I also love Katie's look you selected. Her style is always bright, fun and girly! I must say I 100% agree with that first paragraph. I am always willing and able to try something once, especially when it comes to style and outfits!